very pretty! i passed on this color, but i am regretting it so now! very very pretty nails you have lady! I love, love this color. I wore it last week for the first time. It looks very pretty on you. If I don't say so myself, it looked pretty on me too! It just looks so pretty with the color of my skin. This is the first time I'm on your blog. Glad to have another to read. Mary- Thank you so much for dropping by! It is really nice of Brooke to feature me on her blog! She's such an amazing lady! 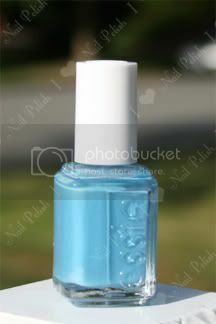 Ohhh, I think this color brings back summer holidays, doesn't it ?